Let me first say that my heart goes out to those affected by the flooding in West Virginia. We have spent a bit of time in that area during the last 3 years, so I recognize many of the landmarks in the news photos and it's heartbreaking to see the devastation. We'll start out in WV as planned and from there we'll visit several Frank Lloyd Wright-designed homes between PA and St. Louis. My architect husband is excited about this change in plans, as am I. Especially since he has offered to indulge MY interests by stopping at quilt shops along the way! I don't need more fabric, though -- well, maybe a few yards -- so my scheme is to hit shops participating in the Row by Row Experience, picking up a license plate and pattern at each. I might even be inspired to make a quilt and enter it in the contest; we'll see. My quilting plans changed last week, too, as we scrambled to piece together a trip that would be interesting without being exhausting. In fact, I got very little done, maybe 10-15 minutes a day. I did finish assembling the center of the Wink & a Smile leftovers UFO. The borders will be the same fabric as the sashing. 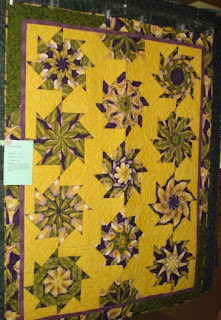 This is the third quilt from those 9-patch centers. I named it Jack's Back because the W&S blocks on point remind me of jacks. Nothing will be accomplished in the sewing room this week at all. Since I had to empty out my clothes closet last week to give the HVAC guys access to the eaves storage area to install a new upstairs unit, I chose to review/reduce/recycle before returning my clothes to the closet. That included deaccessioning some costume jewelry pieces which led me to wondering about the value of some pieces I'd like to part with but might be able to sell for the metal in them. I guess I need to wait till after vacation to check into that. Have you ever sold some old gold jewelry? I made enough to pay for shopping in Paducah once! Dentist/bank/gas today, pack Friday, depart Saturday. No time to sew. I'll be taking a couple of quilts that need the binding turned, as well as some little HSTs that need trimming. 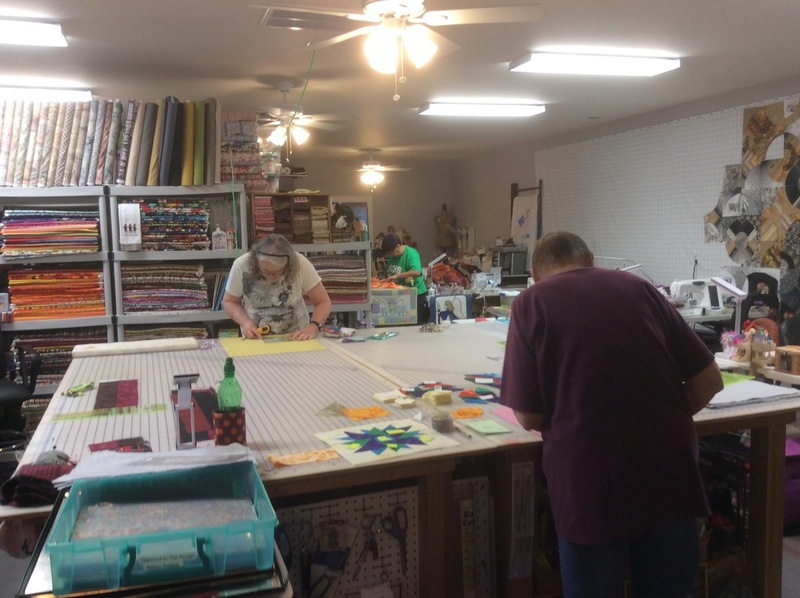 Most exciting, though, will be my visit to the St. Louis Modern Quilt Guild next Saturday as well as dinner with blog buddie Jan at The Colorful Fabriholic. Hope y'all have a safe and happy 4th of July! limit myself to just One Monthly Goal (OMG) and then report at the end of the month. I'm happy to report that I finished my June goal of completing the top that has become known as Tropical Trellis (thanks to Jan at Colorful Frabriholic for the name). I had hoped to have enough extra parts to extend the outside stars into a border, but I couldn't make it work with what I had on hand so I decided to go borderless -- for now, anyway. I don't have anything in the stash that will work as a border and it will finish about 45" x 60" as-is, a nice lap size. So I'll consider it done. And almost a week before the end of the month -- a first! There are still about 10 extra center stars which I'm thinking about combining with some rainbow hearts and plain squares in a top for the Orlando-Pulse Project. ... and with Angela for Scrap Happy Saturday. I haven't had much interesting to write about lately. It's been SO hot inside as well as out, and my sewing time has been interrupted by many distractions. Let's see, I last left you as the 24-hour power outage ended a week ago amidst near 100-degree temps. After a quick cooling shower I headed off to an impromptu 3-day retreat of Procrastinators Anonymous. Several of us were suffering from the ennui malady and we thought getting together to sew would get the mojo going again. When Diana suggested we get together at her house over the weekend, I was ready! However, I think the 24-hour heat wave in our house fried my brain because I only packed one change of clothes (for 3 days!) and I didn't get a lot accomplished. Nevertheless, just being able to get away from the events at home was SO refreshing! Saturday I took a break to attend the Music City MQG meeting where we made enough rainbow heart blocks to complete two quilt tops for the Orlando-Pulse Project. I took the cutoffs from the large sew-flip corners back with me and stitched them into triangle squares (HSTs) to make another top. After I returned home on Sunday I powered through the problem blocks in Tropical Trellis and got that top finished. I'll have a photo of the completed project in my OMG report this weekend. Monday I pulled out another UFO that I've been working on over the last couple months. It's another Wink & a Smile that uses up leftovers from a class sample. All it needed was setting triangles so I got those cut and began final assembly. The triangles will be the same gold as the cornerstones -- maybe not the best choice, but I'm sticking with it! Tuesday I went to the LAQ to pick up Pineapple Sun-day. Somehow when I get dressed up and drive across two counties, I can't get back in the groove to sew when I get home. Wednesday the Main Man had a medical procedure -- you know, the one every 5 years that requires a "responsible adult" to drive him home -- and then it was the weekly grocery run. No time to sew. Thursday we had the upstairs AC unit replaced -- inside and out. (The old one quit cooling the last few weeks every time the outside temps hit 85.) It was an all-day process and the 90+ temps up there spilled over to the main floor making it hard to accomplish anything. I tried going to the basement to sew, but we could hang meat down there it was so cold! I'm glad it has balanced out again! So that was my week. Getting through all that is definitely whoop-worthy so I'm linking up with Sarah at Confessions of a Fabric Addict. Sunday night I laid out all the pieces to assemble the last three blocks of Tropical Trellis first thing Monday morning. Got them all done and wouldn’t you know, the seams on the last side didn’t match on all three. I have overlooked several smaller discrepancies, but wasn’t sure I could put up with those. Yet I didn’t feel like fixing them, either. So I took a break to work on a “secret” block. I haven’t revealed the secret; not that it’s for anyone special, but because if I don’t tell you, you won’t know when I’m slacking (heh heh). OK, so here’s a sneak peek. It’s one of those quilts where every block is similar, but different, so I cut one block at a time and “treat” myself to special sewing once a day. Tuesday, instead of working on Trellis I started making heart blocks for the Orlando Massacre survivors and victims’ families. The Orlando MQG is heading up this effort. Since the Music City MQG is having a community service sew day on Saturday, we have decided to put our efforts into this project. I’m writing this at 4 a.m. by flashlight. It’s so dark and quiet outside. And the night air is wonderfully cool. The sun will be up in about an hour and the heat will rise again soon after. Hopefully the power company will get here soon and get us back in business. It’s kinda critical with MIL on oxygen! Apparently we failed to register with the right people at the power company for them to know we have special needs. Guess what the first call will be this morning! A friend has invited the S’mores (you could call us a bee), to her studio for a sewing weekend while her husband is out of town. It was spur-of-the-moment and will be so welcomed after all that’s been going on. I think I’ll just leave Trellis here and work on another UFO. The power was restored about 4 p.m. (after a bit of arm twisting at the power company). MIL is back on manufactured O2, rather than the bottled kind. The worst part for her was not being able to get her hospital bed back into the flat position. Poor gal was sitting up in bed for almost 24 hours! I made my way to the next county and have done nothing except getting away from the heat and enjoy a bit of wine. My plans for the day have changed. Instead of working on Tropical Trellis, I'm going to devote my day to making rainbow hearts for the Orlando survivors. The Orlando Modern Quilt Guild is organizing a drive for blocks, tops, and finished quilts to give to the survivors of Sunday's massacre. You can learn the details here. I threw together two blocks in less than an hour last night. I've pulled a rainbow of scraps and a more modern "low volume" background and plan to devote my day to making a full rainbow of ROYGBIV hearts. Over last weekend I finished One Block Wonder #4 - Split Pea Soup. The top is finished, a back made. It currently resides in the To Be Quilted (TBQ) inventory. ... progressed through the week. I blogged about issues that arose from using two different brands of specialty rulers, but was able to make a quick recovery. Because I had used all my fabric in the blocks, I dithered about borders. Several of my readers suggested going without borders. The top was going to be nearly square so I used the little bit of the floral fabric to add 3" to the top. Amazingly (considering my normal luck) I found a piece of navy in my stash (actually I raided another project box) that was a very close match to add 3" to the bottom. Then I staystitched the sides. Even with staystitching I was not happy with how the bias edges were looking. I had enough of the replacement navy to add borders on three sides. I also managed to throw together some strings blocks from the few Caribbean blues in my string bin. And I stitched together the finished blocks of Tropical Trellis and assembled one more block. Three more blocks to go and then it will be decision time on how to finish it out. Have a great week and stay cool, y'all. My tips today concern rulers. Heed well, My Friends, but please don't ask me how I know! Try to use rulers from the same manufacturer because they tend to use the same line weight and labeling on all their products, making it easy for you to see and find your reference point. Store notes with UFOs on what ruler you used and what you intended. 1. I know some of the pros say it doesn't matter if you mix and match brands, but I have found there may be very slight variations in dimensions. The biggest and best argument, though, is once you become accustomed to a manufacturer's labeling you will become more adept at using those rulers consistently. Which side of those bold lines are you going to use when lining up your fabric? The important thing is to consistently use the same side of the line throughout your project. 3. You can frequently find several different specialty rulers to accomplish the same task, the 60-degree rulers here, for example. Because these are designed by different people, usually for a specific purpose, there is little consistency in how they are marked and intended to be used. Some highlight the finished block size, and some make the size of strip you are working with more prominent. Bottom line: refer to the instructions and don't intermix different brands in the same project. 4. If there is a lapse of time between starting and completion, it's easy to forget what you were doing. Leave notes for yourself, particularly as it relates to specialty rulers. I try to label my project boxes if a special ruler is required. This accomplishes two things: If I'm grabbing a box for a sew day, I know to check and be sure I have packed the ruler. And the inverse of that, if I'm missing a ruler, I know where to look for it! This whole topic came to mind last night when a situation arose with my current project, Waffle Town. As I said yesterday, this project began as a class sample with step-outs. What I failed to note with the UFO is that I was experimenting with the newly acquired Creative Grids triangle -- the one on the right that is designed to compensate for the overlapping seams at the peak by having a flat top. When I resumed work on it this week I used the Clearview Triangle on the left. Without going into the geometry of why it happens, I'll just tell you that the new blocks were smaller than the first batch I had made several years ago. Each triangle was this much too small and there are 6 triangles in each block! Fortunately the situation was salvageable by taking apart the first batch of blocks and trimming using the Clearview ruler. I hope you'll find these tips helpful. I'm always glad to answer any questions you might have. DWM - What Can I Say? I set a personal (unpublished) goal at the first of the year to finish things and to deal with the leftovers -- pieces/parts and scraps -- immediately and not let them pile up. Inspired by a friend a couple of weeks ago I dragged out an old unfinished One Block Wonder. In the intervening time I have managed to finish the top and cut the back. In spite of my intentions to attack my One Monthly Goal next, this is what's on my design wall today. This UFO was in the same container as OBW#4 and I couldn't in good conscience put it back in the box. 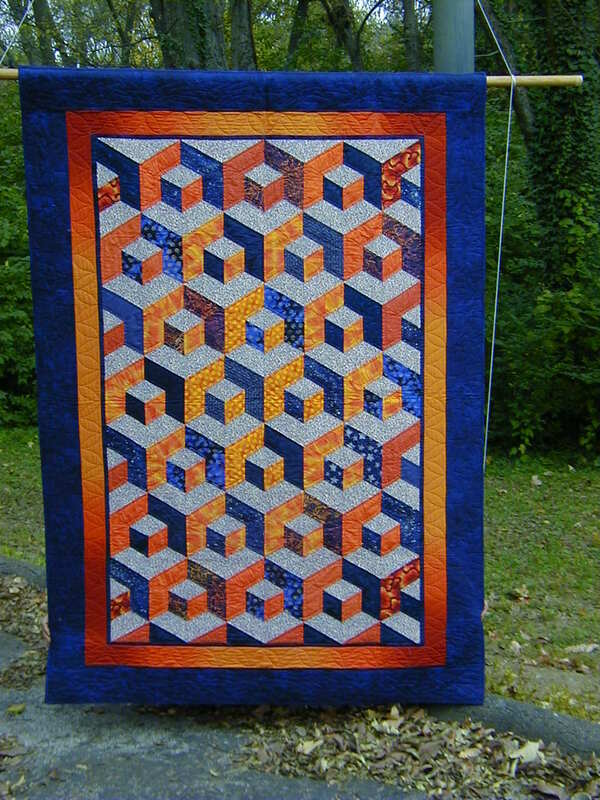 The pattern is Honeycomb Waffle by Sara Nephew (Big Book of Building Block Quilts) and also included in ABC 3-D by Marci Baker. While it doesn't use stacked repeats, it is a hexagonal construction like OBW. When I was actively teaching, this was my most popular class. It looks complex but is really SO easy. Apparently I was using this as my teaching sample because the top was in various stages of completion (known in the trade as "step-outs"). I had a few stripsets to sew and then cut the equilateral triangles yesterday. Today will be devoted to assembling the center. As frequently happens, I backed myself into a corner -- or so I thought. Since it was "just a sample" I had used some small, probably 1-yard pieces so it's not a big quilt. It really needs a border to make it useable. I couldn't find anything in my stash last night, but in the light of day I have found a solution! Hoping to have photos tomorrow. I love kaleidoscopes. I love to play with them; I love seeing the multiple effects as the colorful shards tumble inside them. 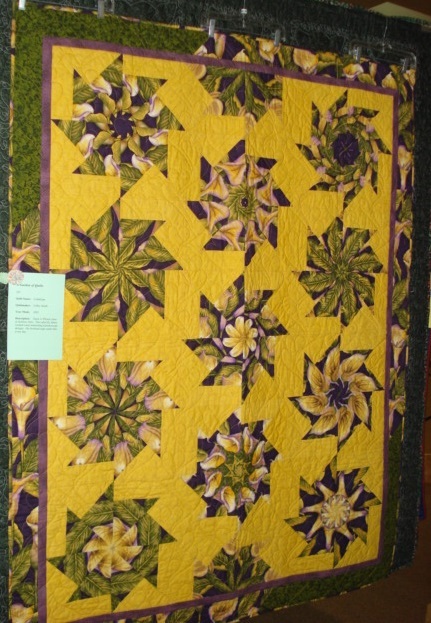 It's only natural, then, that I love kaleidoscope quilts. I tried Stack 'n' Whack soon after Bethany Reynolds' first book came out. Intriguing as the concept was, I was not moved to repeat that exercise. However, from the moment I saw my first One Block Wonder (designed by Maxine Rosenthal and Ann Pelzmann), I was captivated by the kaleidoscopic effect of the hexagons. Perhaps because I had already mastered equalateral triangles arranged in hexagons by studying at the knee of Sara Nephew (and later Marci Baker). OBW #1 - Soup or Salad? I followed that with this springtime confection that is currently on my bed. Apparently I was starting to run out of steam because my current project, OBW #4, was started about 2008-9. The center portion is now finished and I have decided the blue on the left side will be the border. While it's not my OMG for June, with luck it will be finished tomorrow! Linking with Sarah at Confessions of a Fabric Addict. One Monthly Goal (OMG) and then report at the end of the month. Complete modern mini swap quilt, including the quilting - DONE! In addition I began AND finished Chex Mix (top), made from leftover 9-patches. I feel caught up enough that I can comfortably set a new goal for June. The social calendar is relatively empty and it will be too hot and humid to do much outside. I generally look for a UFO that includes the Rainbow Scrap Challenge color of the month which for June is Caribbean blues with a pop of lime green. I think this fits the criteria, minus the lime green, don't you? ... except, as I remember, it was complicated by the addition of analogous colors on both sides. The focus fabric pictured above has both red-violet and blue-violet and two takes on blue-green/green-blue. Orange is the accent opposite those colors. I was also assigned a block -- I don't remember the name, I just remember that I modified the color placement to arrive at this variation. The block finishes at 16" on an 8x8 grid. I had always wanted to do an intertwined setting and was pleased enough with the result that I considered making an entire quilt with the block. Problems arose when I sewed for a whole day on a different machine without checking the seam allowance! Perturbed (putting it mildly) I set the project aside. In the intervening years I apparently found time to resurrect the project because I now have 8 full blocks finished and 14 of the centers done. There are other finished units in the project box as well as many pieces cut. Tonight I will kit up blocks and decide what needs to be done to make a finished quilt top. SO my One Monthly Goal (OMG) for June is to finish this flimsy (still to be named -- any suggestions?). I have a few minor things on my list but I think all will be doable. Hop over to Red Letter Quilts to see what goals other quilters have set. I have enough pieces/parts to make a total of 12 blocks. I will use parts from those extra center blocks to extend the secondary pattern in a few places. I'm out of the background fabric so will need to get creative. Stay tuned! Linking with Angela at soscrappy.